Home / Business and Marketing / food / product or service reviews / Curious case of Swastiks pickles! January 2019 Update: Someone from the brand have contacted me and shared numbers of few distributors. So now I have some contacts which I can use if I need to buy it in future. They said they will update the website as well. So good to see they finally responded. This is the tale of a good food product brand that doesn’t seem to have any online presence. Pickles are integral part of Indian households. All over India different types and flavors of pickles are consumed during meals. If you go to a supermarket, you will find some nation wide brands -like Ruchi, Priya, Aachi, Mother’s Receipe and so on. I personally like Ruchi and Priya brands- but there’s one concern with these national brands- they are very expensive- a 200-220 grams bottle will cost INR 70. I think this is because of their high transportation cost, higher profit margins and marketing spend. If you’re using couple of spoons each day, a 200 gms bottle will exhaust within 7-10 days in a household, which means you will need 3-4 bottles a month- close to Rs 200-250. So the next best alternative is buying loose or less popular brands. Many less popular/local brands are available for about Rs 100 per kg or less-this is very reasonable price- just 33% of what established brands cost. But there’s one problem with these cheaper options- they are not consistent in quality, taste and availability. Sometimes you will not like the taste, sometimes they won’t be available next time you visit the shop and so on. So finding a proper brand- which is reasonably priced and is available all over with consistent quality has been a challenge. There’re many brands serving a highly localized markets. You may be aware of many such brands/sellers in your locality. This post is about brands having at least a state wide presence. 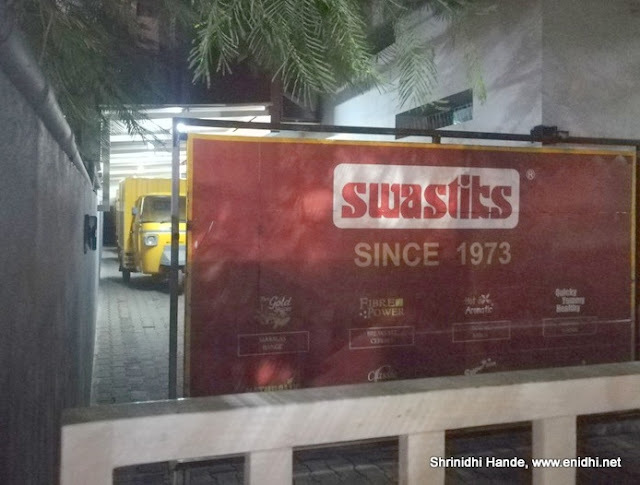 Earlier this year, when I visited Tiruvannamalai, I spotted this brand- Swastiks. Their pickle was available for about INR 85 or 90 per kg- I brought home 2 kgs and liked the quality. I wrote a post about this on Facebook and many commented with positive feedback on Swastiks pickle. Few months down the line, the two bottles I had purchased got empty. 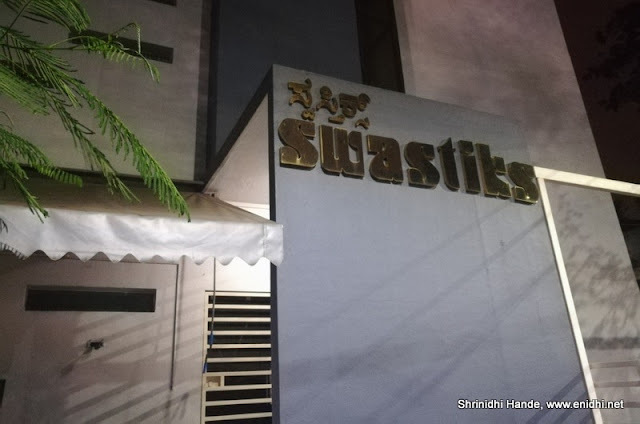 But most supermarkets and stores in Chennai didn’t seem to stock this Swastiks brand. Naturally I turned online to check where can I order this pickle or buy from. It was supposed to be an easy task. To my surprise, I drew a blank. Apparently Umesh Derebail had mentioned in facebook about Swastiks' availability in D Mart with 1+1 offer- I somehow missed this. Swastiks do have a website- http://www.swastiks.com it is printed on the pickle jar as well- but unfortunately that is where their online presence ends. The website was made in 2011 using old technology- it won’t even open on mobile or in many browsers that can’t support old flash player. The domain hasn't expired, which implies someone has been paying to renew it. Website had a contact us form, couple of addresses and some product information, not updated since it was initially created. It won’t take online order, it won’t list stores where Swastiks products can be found, it is not updated in years. So the website of Swastiks Masala, Pickles and food products was practically useless. The bottle had a customer care email ID and phone number. I sent them an email appreciating their product and asking details of stores that sell their product. No reply even after 2-3 weeks. The phone numbers listed on the website or bottle do not work. They have zero presence on social media. So I hit a dead-end. No way to contact the brand, no information on where to buy their products. I contemplated another trip to Tiruvannamalai- but it would mean spending a weekend and around 500+ Rs on fuel and other expenses. Not a viable option to travel all the way just for a bottle of pickle. However, Swastik’s factory address was somewhere in Anekal, outskirts of Bangalore- so I would probably make a trip direct to their factory? That sounded exciting but again time and money factors pushed it away. Their website listed 3-4 address in Bengaluru-without any details (is it a store? Warehouse etc). One of them, the Jayanagar T block one was close enough for me to visit during last weekend’s Bengaluru trip-so I even went there in person- I found the location locked (it was a Saturday evening)- but Swastiks logo was there, a few goods autos were inside and a staff vehicle, so it looked like facility is operational but not for B2C. No one was around to ask further details, so I returned back. Checked with multiple popular stores in Jayanagar and DVG Road if they have Swastiks- answer was a negative. No popular stores seem to stock Swastiks. I wondered how are they doing business without any online presence, not responding to mails, not keeping their products in popular stores. Eventually I was in for a surprise- as I spoke about this pickle to a relative, they recalled purchasing it from a neighborhood store, rang them up to confirm availability and within minutes, I was at that store and bought 2 bottles instantly. This was a nondescript store somewhere in Uttarahalli area. So while every conventional way failed, I just got lucky because people with whom I interacted were able to help. There’re still lots of brands out there doing good business with their offline network, without needing any online presence. 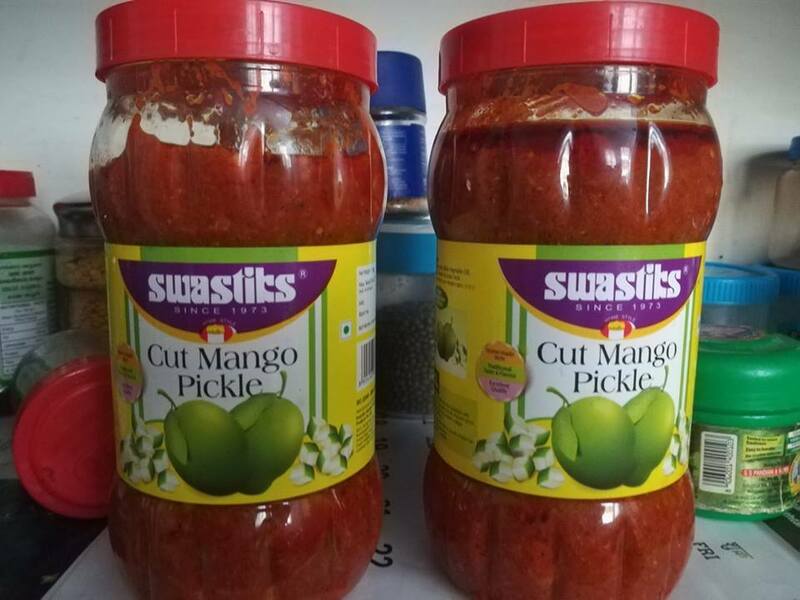 Swastiks do have a great range of products-pickles, masala etc and a strong offline distribution network- I could locate them in Tiruvannamalai n Bengaluru (Srinidhi TG said he bought it in Hasana)- I am sure they supply to lot more towns-just that it was near impossible to locate a store and buy. I wrote this post because there isn’t much information available online about Swastiks food products and this post may help their customers trying to know more. What is your favorite pickle brand? Would you take lots of trouble if finding a brand's product is not easy or would you simply shift to another brand? Do you think brands can afford to ignore online presence completely and still do well? To the Swastiks Product owner- if you are reading this, thanks for the good product but may be you might wish to make it little easier for your customer to discover and order your products. Without having to spend lots of money you might want to maintain a basic social media presence or make your products easy for discovery by listed them on say BigBasket. May be you’ve limited capacity, doing very well within your network of sellers and not looking to expand/grow- which is fine, but at the least you can update your website, phone numbers and have someone to reply to emails at least. Best wishes. there are quite a few telephone numbers available online - https://www.justdial.com/Bangalore/Pickle-Retailers-in-Rajajinagar/nct-10366039 ,they should help . Supermarkets and big stores only market products where they can make money and commission ,they are least bothered abt quality.the average person does not bother much ,they just go and pick whatever is there and buy that product. Thanks for the link. I am good for now, as I got the product. Yes, stores will have their own priorities. Hello Mr.Shrinidhi Hande this is Rahul Jain from Swastiks Masalas Pickles & Foods Pvt Ltd. Sorry for inconvenience caused by us. Kindly share your email or contact number which will help us reaching you.